With the Ridekick pushing my vintage Schwinn, I had many great rides. It seems like I shouldn’t have to tell you about this great way to convert your bike to E-power. As I rode with it for four months, it was surprising how many people I met who had never seen one or knew what it was. When I asked the good folks at Ridekick for a chance to take this extended test, I suggested to them that they needed to find more ways to get the word out about their E-trailer. So on top of reporting my findings to you, I made a personal pledge to show it to as many people as possible. Originally I was to have this Ridekick for a month. As they continued to see my posts on Facebook of all the great places I was riding it, somehow I managed to enjoy it for quite a bit longer. One of the rides it powered me through was CicLAvia. With over 100,000 people riding the closed streets of Los Angeles, you can imagine how many riders got their first glimpse of a Ridekick E-trailer. I got a chance to try out a Ridekick at the beginning of the year. If you go to read that article (and you should), you will see how much I liked it and the concept it follows. Things haven’t changed one bit since this long wring-out with the E-trailer. There are lots of reasons I think it could be the perfect bike accessory for so many people. The list of reasons is a long one. It starts out with the fact that the Ridekick works so well. My Schwinn World Tourist and the Ridekick got along just fine. So, you’ve decided having a electric-assist bike is for you. You might already have a bike that is in good shape and fits you well. Sometimes riding your regular bike would work better than an E-bike. You might not have room for that second bike. You may not want to spend the extra (big) cash for that E-bike. Maybe you want to haul stuff with your bike, but that extra load might be too much to handle without a little help. I just can’t document all the good ways it could help you here. As I write this post, I just took a break to reread the Ridekick article I wrote in January, almost a year ago. Everything I wrote then still applies, so please follow the link below to read it for yourself. Rather than repeat those thoughts, I will concentrate on the things I did during this long four months of ‘Ridekicking‘. I moved it from bike to bike and took it on so many rides. With rides ranging from trips to the market, yard sale excursions, mellow group touring and long treks on the open road, I really put it to the test. First up I hooked it to my late 60’s 5-speed Schwinn Collegiate. This was a good match and I was pleased to find what a good combination this was. Putting on the trailer hitch and the throttle with cable took mere minutes. I kept talking about how modern technology was mated to old-school bike fun. The Ridekick multiplied that fun by a big factor. I did a lot of miles this way. 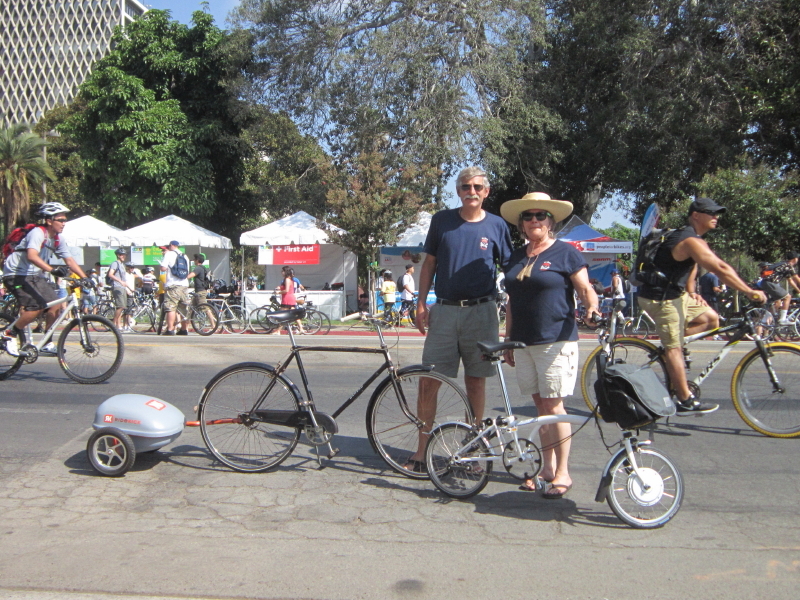 At CicLAvia, you can be sure I didn’t see another Oxhead bike like mine. I didn’t see any other Ridekicks either, but one of my friends said he did. Next up was my oldest bike, an early 50’s Oxhead. This classic single-speed is one of my favorites and I never imagined it would get a E-boost. I personally liked the old and new look of the two, and more than one person pointed it out too. As the Ridekick got moved from bike to bike, it was hooked up to the Oxhead more than once. 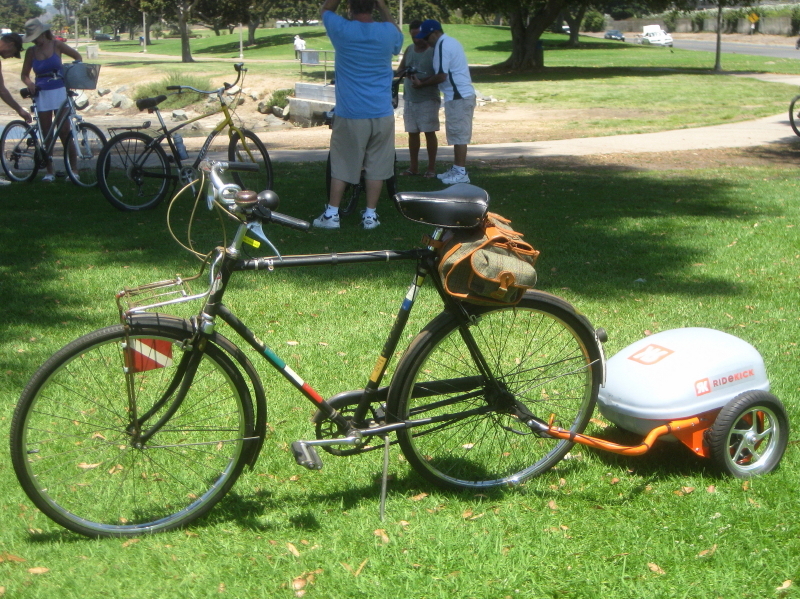 This is the bike I took to CicLAvia with the E-trailer. I think it was mated up to my 3-speed Raynal the longest. This is the bike I use for our local Tweed Ride. Made in 1958, I got this bike from the original owner. It is in pretty good shape for such an old bike. Once again, the swap of the hitch and wiring harness was quick and easy. Every time I used the power of the Ridekick to help me up a hill, I smiled wide and strong. You might think that when I used it with my early 80’s Schwinn World Tourist that it was the newest bike I tried it with. That wasn’t the case, I as powered my fairly new beach cruiser two different times for over a dozen long rides. This is a single-speed coaster brake bike. I was extra careful on the down hills with that set-up, but never once got in over my head. 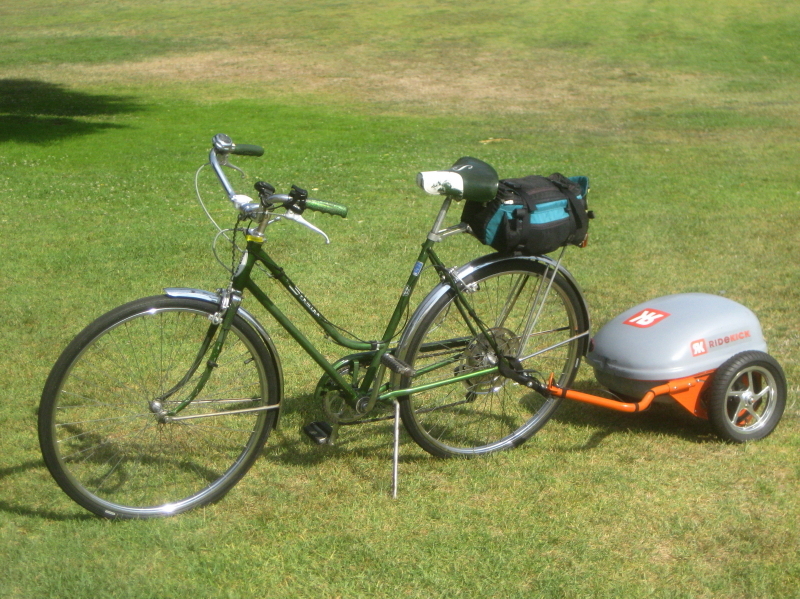 In all, I powered five of my bikes with the electric-assist Ridekick trailer. On one of my many group rides, the Ridekick did its job just as advertised. Here it is hooked to my old English 3-speed Raynal. I think my longest ride was around 15 miles. I was just about out of charge on all the rides I took at this distance. The Ridekick I tested is the standard version with a SLA (sealed lead acid) battery. They say 12-15 miles is the normal battery range with the supplied battery. I was really hoping to get the optional lithium battery equipped Ridekick, but it just didn’t work out that way. With the lithium battery you can double or almost triple the amount of distance the Ridekick will take you. Of course it costs more, but in all reality in the long run it will cost you less. A lithium battery has 3-4 times the life of a SLA battery depending on how you use and care for the two different batteries. Plus add in the better performance, lighter weight and the lack of immediate charging needs after each use and you have a winner. As I have reported before, I would recommend a mail-order (internet) purchase of a Ridekick, where buying a complete E-bike that way could be risky. If you do have any problems with your Ridekick E-trailer, they will be with small, easy to replace components. With phone and online support, the built-in diagnosis system and the great crew at Ridekick, any issues can be resolved quickly and easily. With a complete E-bike, you should be so lucky. The two-way shipping of a E-bike can be costly and a big hassle. 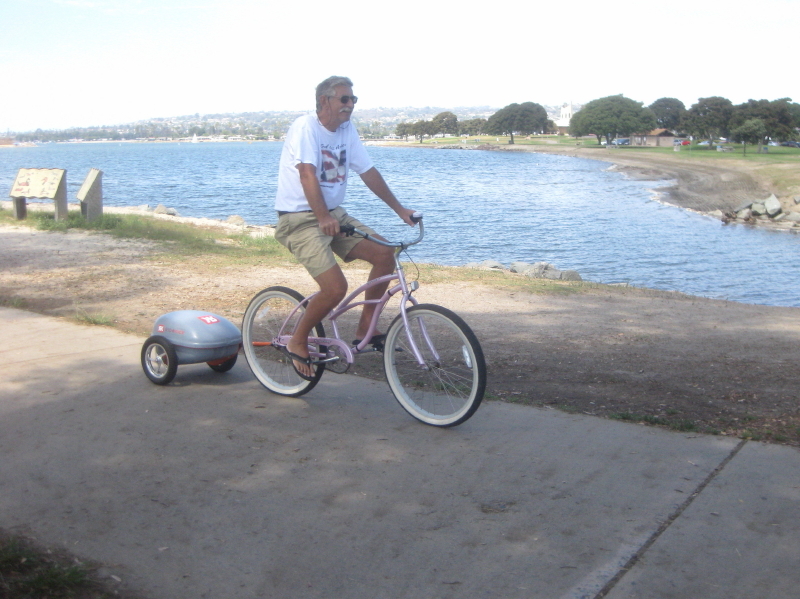 Beach cruising with power, the bike path at the bay is the perfect way to enjoy the Ridekick E-trailer. I think this is a great product. It is made in America (although I have to assume some of the pieces are shopped from other sources). It does exactly what is said to do. It turns most any bike into an E-bike. It can be used when you want and left behind when you don’t. It carries your extra gear and adds immensely to your bike ride. I like the people who make and stand behind this E-trailer. All-in-all, I can’t imagine anyone not fully enjoying what it can do for you. This Ridekick is a demo unit that spent time at a couple shops before I got it. It has been run hard and long. It is back at the Ridekick factory in Colorado now, where they are giving it a full inspection to help make sure all their future products are built to perfection. I sure didn’t want to see it go, but that is the way these tests work. I was sure glad to hear that I am first in line for trying out any new or up-dated products they get ready to offer to the E-bike public. Thanks for the ’ride’, Ridekick. Get on your bad motor-scooter and ride, Turbo Bob. “The bicycle is the noblest invention of mankind.”—William Saroyan, from his introduction to ‘The Noiseless tenor’. Please read the previous article I did on the Ridekick to get more details about it and its use. Hey Bob good seeing you at the Coronado ferry landing. I really like my ridekick and am planning on upgrading the batteries. 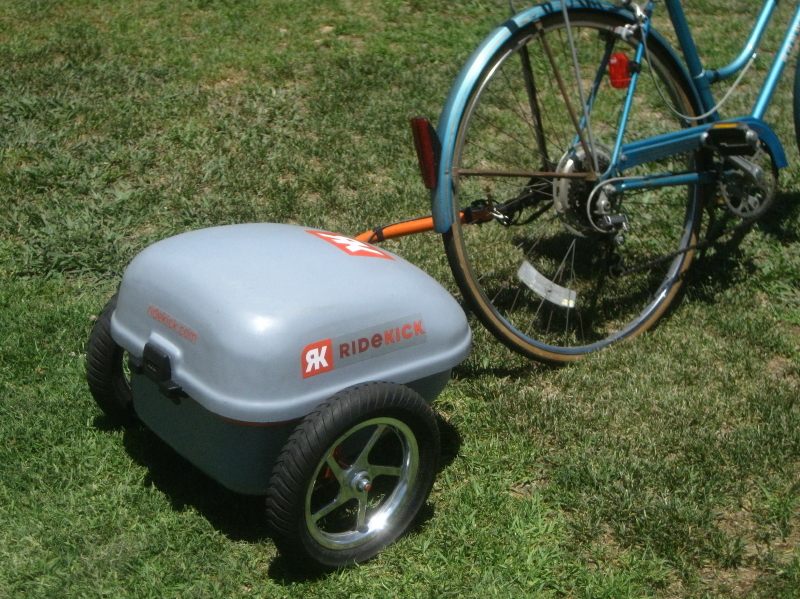 Initially Ridekick planned on making a child bike electrical-assist trailed, maybe they should work on that idea again : as a parent of 2 I have a Burley and it would be great. Yes, I rode the prototype 2 years back (videos are on my You-Tube site). RideKick has recently come back from a hiatus, yet I am not sure just how active they are, or when the new model will surface. It is not only bigger (holding two kids or ? )—costs more—but has modern motor and battery components. The RideKick is a great product and mirrors the ultimate in simplicity for giving your ride a E-boost.